You’re more likely to see odd waistcoats being worn badly than well. Because they usually don’t fit, and nothing is less forgiving than a waistcoat. Because they are often, bizarrely, worn in bright patterns and colours. And because, essentially, men see them as unusual tailoring items – when they are more akin to knitwear. This is particularly true when the waistcoat is designed to be worn on its own, as this grey cashmere one is, from Spanish tailors Calvo de Mora. The paleness of the colour and the texture of the material both have more in common with a nice V-neck sweater than with tailoring. Of course, the parallel works particularly well as the waistcoat has a cloth back – rather than silk or similar synthetic. This is a style I particularly like – it makes the waistcoat immediately more casual, and easier to wear without a jacket. The waistcoat of the Chittleborough & Morgan suit I had made last year also had a cloth back, which makes it easier to wear with the trousers alone. There’s something about that expanse of shiny material which is immediately formal and dressy, particularly in an environment (such as most offices) where not everyone is wearing a suit. If you do go down that route, I suggest thinking carefully about the position and depth of the waistcoat pockets. It’s helpful if they can hold a mobile phone and a slim card holder. The C&M one even had an in-breast pocket, which is handy. The fit from Calvo de Mora is good, if not perfect. It fits well through the body and hips; it could be a touch tighter on the neck; and the same applies to the shoulder line. But these are all small points – and this is 9oz cashmere. Worn here, for a photo shoot that also included the Gieves pea coat and Calvo de Mora sports jacket, with charcoal trousers from Chittleborough and a linen shirt from Luca Avitabile. 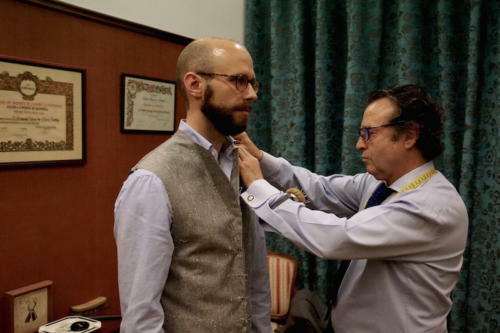 More on Calvo de Mora, who are a great value Spanish tailor, here. A couple of images from the first fitting in Madrid, below. You can follow the discussion on Wearing odd waistcoats by entering your email address in the box below. You will then receive an email every time a new comment is added. These will also contain a link to a page where you can stop the alerts, and remove all of your related data from the site. Really nice outfit Simon. I realize how stylish one can be wearing just greys and blues and therefore focusing on the cloth and the design of the items. For a while all the clothes I buy or have made have been grey and blue, with leather accesories in brown and knitwear in dark green, purple and orange (the only eccentric color I permit myself to wear). Something I have learnt from PS and makes me feel more confident with my wardrobe. What is the cloth of the trousers? lovley waist coat, I’m getting a lot more into them after getting one of your ones from John Smedley. Just a small point but shouldnt the bottom button be left undone? It’s cut to not be undone, but it could well be left undone, yes. There’s not should or shouldn’t – it’s merely a question of whether you like the style (relaxed, less formal…). Personally I dislike waistcoats that are obviously cut to not be able to button the bottom one. It looks artificial. I think your waistcoat is designed so sleek that the usual unbuttoned button would disrupt its harmony. The position of the lowest button and cut of the flaps is perfect. 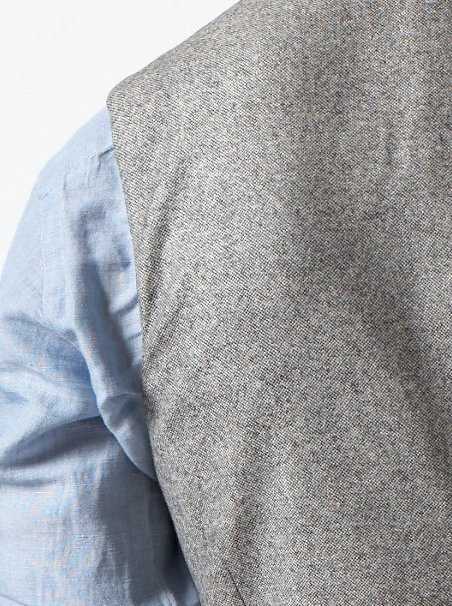 I can’t tell for sure from the photos, but does this waistcoat have a full collar? I don’t have any waistcoats with a full collar, but I’d imagine it doesn’t work well under a jacket. It would most likely result in a roll in the back of the jacket under the collar, right? It does have a full colour, yes. I find it works ok – certainly on this and my C&M suit (and the C&M one is much thicker, being a heavier cloth. What’s the difference between a collar i.e. you probably mean what I call lapels and “FULL” collar? Thanks, Simon! I didn’t realize that because none of my waistcoats have lapels or collars, and my only connection to the shops where I buy my clothes is by Internet, where description and photography cannot replace a first-hand education. Simon answered it. I do not mean lapels. Most waistcoats that have lapels just have lapels and don’t have a collar that goes around the back of the neck like a jacket has. Typically where there are notched lapels on waistcoats, there are separate pieces at the top that mimic the look of a suit’s collar but lay flat against the chest and end at the shoulders. This one has a full collar, which goes around the neck. It makes the waistcoat work better on its own without a jacket. One of my waistcoats by C&M has lapels, but they cannot be lifted up. They stop at the shoulder seam, that they are sewn together with. So, no collar. Lovely outfit Simon! 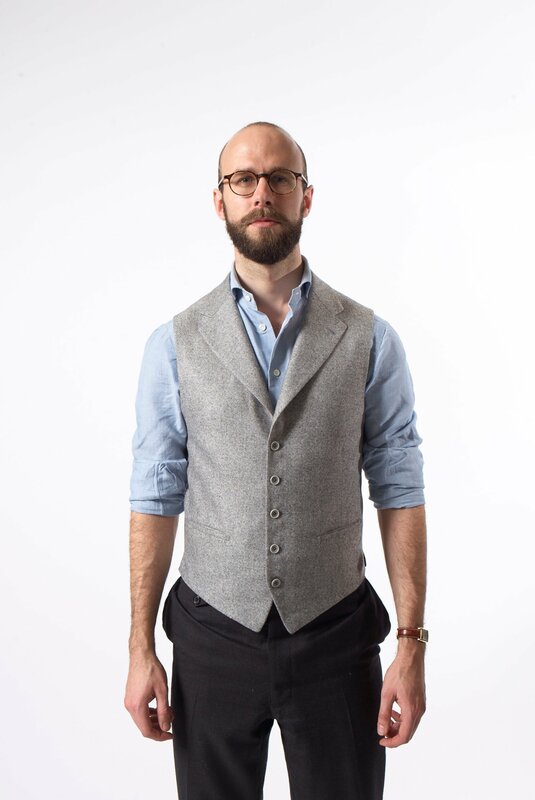 I’m a huge fan of the odd waistcoat, for all the reasons you outlined in your “logical waistcoat theory,” but I agree they are far too often worn badly. In addition to the reasons you outlined, I think this is because they are normally cut far too short to wear with modern lower rise trousers. This may be a hangover from the days when they would only be worn with traditional high rise trousers but is also because a long-enough waistcoat would not flex at the waist and so would be very uncomfortable when sitting down. Thanks, yes I know it. 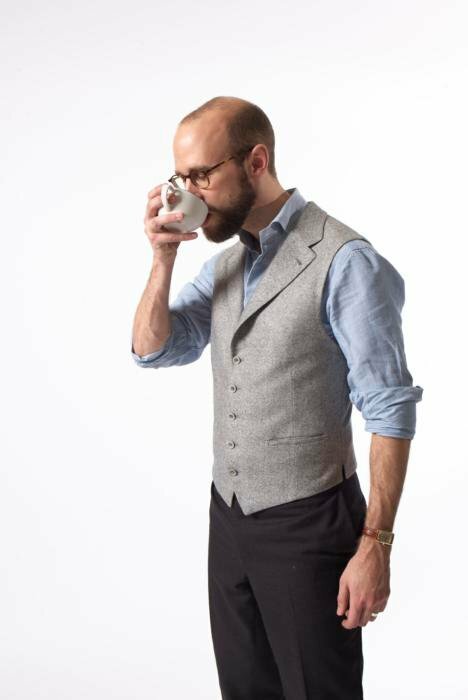 I’ve had waistcoats made with lower trousers from a few people, including Cifonelli and others, and the solution is usually lowering the front but cutting up a little higher at the sides, so the points are slightly more extended. That way the waistband is generally covered but the proportions overall don’t look too long. Regarding jamiemcp’s comment on the John Smedley knitted waistcoat – i agree. I believe they are indespensible in ones wardrobe although personally i would not have a fabric waistcoat made. Back to the knitted version, I purchased one of these from your collaboration with JS but i must say the green is awful. It is a truely unusual green that goes with nothing. I was expecting a bottle or racing green but this colour is bizarre! I undid the label without thinking and so could not send it back. How was this colour arrived at I ask? It’s a long time since I’ve seen a stylistic innovation that works in such a classic way. Fabulous – well done Simon and well done Calvo de Mora! Do you intend to wear this only on its own? Or would you wear it as an odd waistcoat under a jacket? I’m interested in your comment about the bizarreness of wearing a coloured or patterned odd waistcoat. The most common situations for wearing an odd (i.e., non-matching) waistcoat are morning dress and a hunting waistcoat. Maybe people extrapolate from that to wear coloured waistcoats with other clothes, although I haven’t seen such a thing. I agree with your comment about the importance of fit, though. 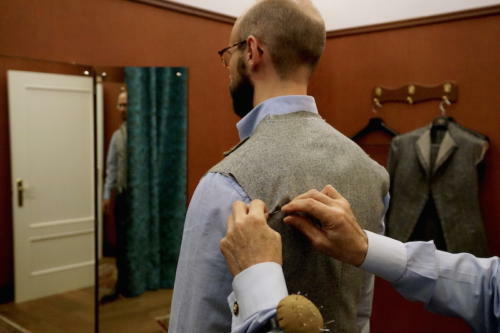 It’s the one garment where you almost have to go bespoke. It could work under something else, yes, though that’s not easy. Good point on the extrapolation from other odd waistcoats. You want to substitute a waistcoat for a jacket, that’s why questions about waistcoats worn underneath jackets might not find your echo. For me, I think single-breasted waistcoats WITHOUT lapels look better. (Your lapels have a nice shape.) I think SILK is the better cloth, and in floral design, etc. beautiful. I think Favourbrook can be trusted for design, but sweat causes waistcoat cloth dyes to be absorbed by shirt cloth. PS: Cordings offers a lightweight (14 ounce) keeper’s tweed jacket, and I see their normal keeper’s tweed jacket has an action back. I wonder if an action back is in principle an advantage, and consider when I have enough money to order such a durable keeper’s tweed jacket (definitely not in heavy weight) if I should also request it be made with action back? I’ve found Oliver Spencer to offer some lovely waistcoats (slim cut, with self backing post-boy length) in great materials. Some lovely styling on pockets and odd buttons. Looks like there’s a fan base, since they sell out quickly in the stores. Who made your pants? Do they need to be pulled up, or are the pockets behaving strangely for other reasons (perhaps the picture just catches you in a moment of odd stance)? Sorry, I know the post focuses on the vest, which looks very nice, but my eyes are drawn to the aggressive flaring along the hips…. Very good article and some nice comments from Nestor about how one can do so much with just two colours. On the subject of waistcoats if we consider for one moment how impractical a suit jacket can be, for example leaving one’s chest exposed to the cold and generally not always providing enough warmth , it seems bizarre that waist coats aren’t almost compulsory. On a wider point we often decry the standard of general dress sense amongst men but we do also need to recognise that wearing a suit jacket for many men is constraining , provides lack of warmth and doesn’t allow many men to even raise their arms sufficiently. A waistcoat , at least , solves one of these problems however the cut and low arm holes of many RTW and MTM suits still leaving us feeling constrained and unable to flag down a taxi with dignity ! Need to start a campaign ……Men demand RTW and MTM suits with high armholes . I think it’s very smart ! Absolutely. If I was to have one thing made from Joe, it would be a waistcoat along these lines. It would be a thing of beauty. What’s your stance on a chest pocket on the waistcoat, maybe with a pocket square? I don’t mind four pockets rather than two, but never with a pocket square. Simon, many thanks for your (continued) insight on waistcoats, and thanks as ever for trying to reply to your ever curious readers. Speaking of which, could I ask some advice? I’m in the (wonderful) early stages of obtaining my first bespoke suit, a 3pc navy lounge suit. Harrisons, plain weave, 13ozs. Peaked lapel. It’s not an everyday suit. I want the 3pc look for formal meetings but also envisage having occasion to wear it as a 2pc – waistcoat and trousers in some lines of my work (presenting,etc). I will be keeping the same cloth for the waistcoat as the jacket, and want to add some individuality without ruining the overall, relatively formal and sharp look. So, stealing tips from across your blogs old and new, do all these things work together? – A waistcoat with notched lapel? – Would you ever consider getting an odd waistcoat made at the same time for more versatility as a 2pc? – Do you have any advice on other individual elements – colour/style of buttonhole stitching and the lining? – And finally what is your view on separately a John Smedley (different colour) knitted cardigan or waistcoat. Could/should a cardigan ever be worn underneath the jacket or only as part of a 2pc? Ditto the knitted waistcoat? Hey, sure happy to help. – Waistcoat with notch lapel sure. It’s what my C&M suit has. – Self on the back I’d certainly recommend. Sits just fine. Less formal, but more versatile. – Probably not mussel shell buttons. – Never contrasting buttonhole stitching! It looks so cheap. I’m considering commissioning something very similar–3 piece suit in 13 oz navy wool, waistcoat with a self-back and lapels (likely notched)–so was reassuring to see you were supportive. Goal would be to wear it jacket+trousers often, jacket+waistcoat+trousers in winter and more formal occasions, and waistcoat+trousers for a more casual summer alternative. Do you have any recommendation on single-breasted v. double-breasted waistcoat here? Although I love a suit or coat that is double-breasted, my instinct is to go with a single-breasted waistcoat so that it appears less unusual and will feel more versatile. However, you have previously espoused the merits of a double breasted waistcoat and wonder if you feel the same today and/or think it would make sense here? Hey. I’d go for a single-breasted waistcoat if you want to wear it without a jacket, as you suggest. A DB waistcoat can look great, but a little showy anyway and particularly so without the jacket. I’m getting married very soon and due to time and budget restraints, won’t be commissioning a new suit. Is it possible to wear separate waistcoats with worsted suits as with a morning coat? I ask because I would like to add a waistcoat to my Graham Browne single breasted, but there is no matching cloth available. Would buff or light grey work in this case? I would love to add this extra level to the outfit, but the examples I have seen online so far have not convinced me. Your input would be much appreciated. Would you recommend a small number of fabrics and colours for odd waistcoats? I already have a blue SB no lapel from a suit and a 4-button buff DB shawl lapel, both in worsted wool. I’m considering SB no lapel and in something like a light grey flannel, or racing green flannel, or a tweed. Have you got any opinion? I’m starting to create some of my own pieces. Having made a SB no lapel in a (fairly cheap) light brown flannel, I find that it’s a perfectly wearable piece and fits just as well as anything MTM and will start to try working pockets (instead of false) and lapels.